It just won’t go away. Now a lawsuit filed against the U.S. Equestrian Federation by its former laboratory director, Dr. Cornelius Uboh, has added yet another chapter to the saga that rocked the organization in 2018, after the mishandling of a sample in the federation’s drug testing lab prompted an embarrassing reversal of punishment levied against a high-profile trainer and hunter rider. “We have egg on our face,” USEF President Murray Kessler freely admitted following the revelation. It came a year after the well-publicized announcement about the suspension and fining of Larry Glefke and Kelley Farmer. The case involved a horse they showed that tested positive for GABA, a prohibited substance, which can have a calming effect. USEF didn’t waste any time confronting the situation. It conducted an audit of its laboratory and appointed an ad hoc committee to do an exhaustive investigation of the facility’s operation and the drug testing program, which is a cornerstone of the federation’s mission to insure a level playing field in competition. It also fired laboratory director, Dr. Uboh. 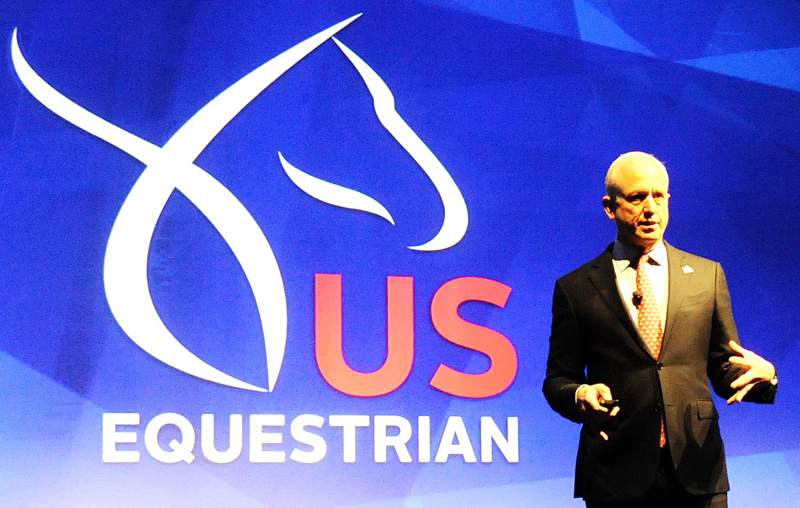 Named in the suit, filed last month in Lexington, Ky., were Kessler, USEF CEO Bill Moroney, USEF general counsel Sonja Keating and Kent Allen, chairman of the USEF veterinary committee. According to the lawsuit, Uboh became “a convenient scapegoat” for USEF when it “needed someone to blame” in the wake of the GABA scandal. Uboh alleged that his employment agreement, which called for 12 months of base salary in case of “termination without cause,” was violated when he got only three months of severance pay. The legal document contends that the primary reason given to Uboh for his termination was “the displeasure of the USEF membership” with the settlement reached in the Glefke/Farmer matter. During the testing process, Uboh’s lawsuit continued, he was informed that a blood separator was breached, but in his opinion the breach was not a contributing factor to the finding that a concentration of GABA in the “B” sample was six times higher than the “A” sample. It was Uboh’s responsibility to report “only a verifiable and scientifically defensible result to the USEF,” and there was a question as to whether the breach of the silicone separator caused this “unexpected result,” according to the lawsuit. He did not shield any information from the federation, but rather, he did not provide data from a “brief experiment” conducted to determine the effect, if any, of the breach on test results, Uboh’s complaint stated. “That data was known by and readily available to USEF officials prior to the hearing and Dr. Uboh’s testimony. Subsequently the fiction was created that Dr. Uboh withheld these test results and the underlying breach of the silicone separator from the USEF. This is simply not the case,” stated the lawsuit. Uboh’s lawyers did not reply to phone calls, emails or texting requesting an interview so we’ll have to wait for specifics until the case goes to trial. That is, if it goes that far and isn’t settled out of court, as can happen in these cases. Meanwhile, following the report of the lab investigation, the USEF is finalizing plans to have the University of Kentucky handle its drug testing. This approach has the advantage of putting the testing at arm’s length from the USEF’s hearing process that determines punishment for violations. Another plus for the USEF/UK collaboration is the involvement of Dr. Scott Stanley, who headed California’s equine drug-testing laboratory. He joined the University of Kentucky in January as professor of analytical chemistry at the Maxwell G. Gluck Equine Research Center. Stanley is considered one of the foremost experts in the drug testing field.